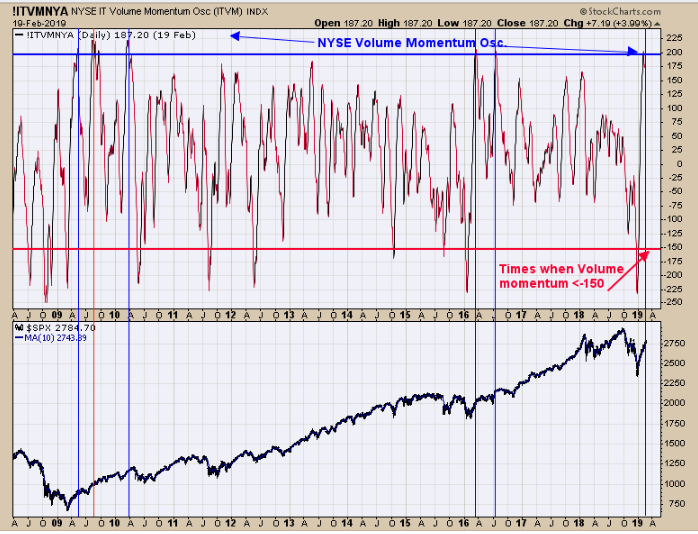 The top window is the NYSE intermediate term Volume Momentum Oscillator. We have shown this chart before. Previously we had the upper limit set at 175 and we have it to 200 which dropped off some of the examples. Going back nearly 11 years there where 6 times this level was reached and five came near short term highs.Once the market did turn down the retracements where mild (except the one in 2010).With strong volume momentum, the potential retracement (when it does come) may be mild. We are thinking 200-day moving average near 2725 SPX may find support. We will wait for the next setup. The window below the volume window is the NYSE 5 period moving average of the tick. Five-period tick moving lower usually is a bearish sign for the SPY. 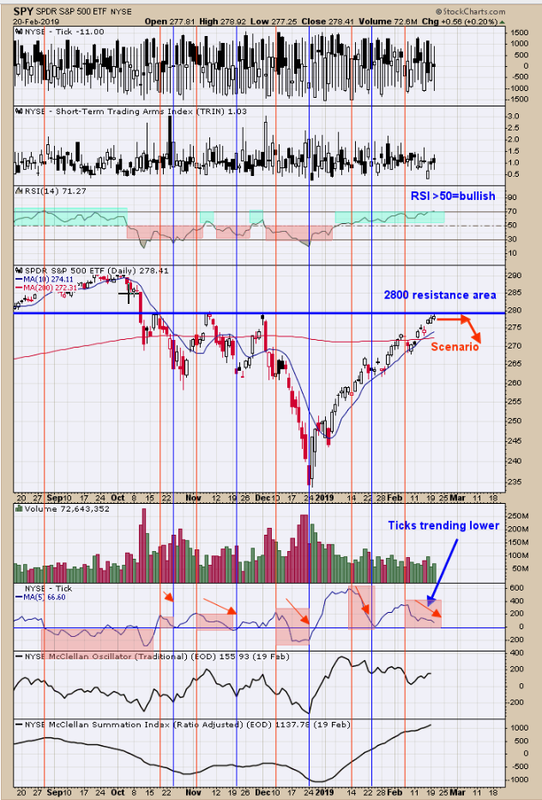 SPY can go higher short term, but gains are normally given back.SPY is running into the resistance level near the 2800 level and the RSI is over 70 and not a place to think about a short position. What may develop in the coming days is more of a sideways range where RSI falls and if the 5-day ticks drop below “0” a bearish setup could develop. The potential pullback may find support near the 200-day moving average which is near the 2725 SPX range. Bearish signs are accumulating but momentum is still up. Neutral for now. The second window up from the bottom is the weekly Bullish Percent index for the Gold miner’s index. The bullish percent index measures the percentage of stocks that are on point and figure buy signals. Recently the Bullish percent index jumped from 37.04% to 40.74% to today’s 44.44% showing the market is getting stronger. The top window is the weekly RSI for GDX. Readings above 50 show GDX is in an uptrend a below 50 a downtrend; current reading is 68.41. On the weekly GDX, we put the moving averages of a 5, 9, and 13 period. When all three cross to the upside a bullish signal is triggered (circled in blue with blue vertical line).GDX has whipped back and forth over the last couple of years going into the bullish crossover in October. 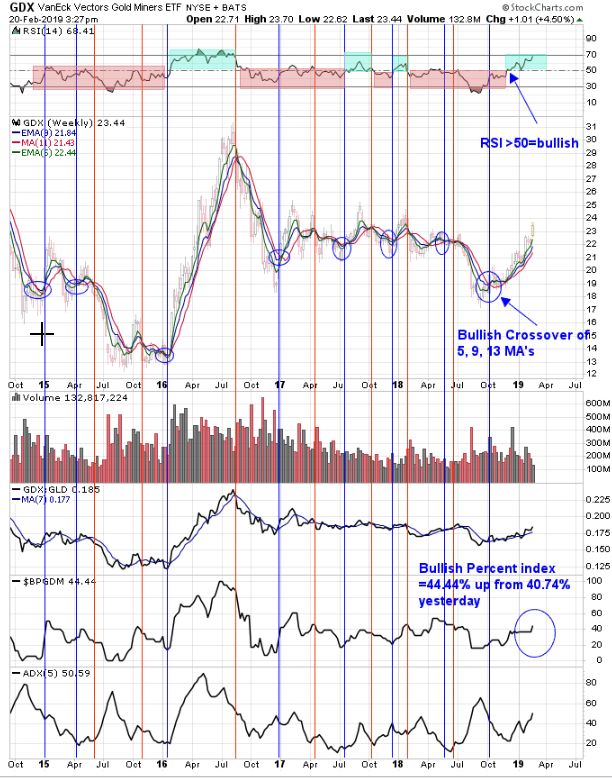 Since the weekly bullish crossover in October, the moving averages have remained on a buy signal. How long will this buy signal last, we don’t know but could last several more months. The weekly RSI is above 50 and the weekly 5, 9, 13 moving averages are on a bullish crossover and the Bullish Percent index is getting stronger; rally has further to go. Long GDX on 1/29/19 at 21.97.